Many people probably haven’t had the opportunity to try sorrel, a surprisingly spritely, bright green herb. Yet it was not so long ago that this tasty herb was a standard in kitchen gardens. 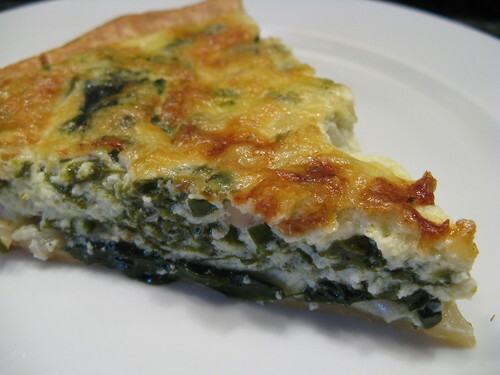 The flavor of the tangy, lemony, spinach-like leaves should earn this a place in everyone’s kitchen. Rich in potassium and vitamins A, B1 and C, they have been part of healthful diets and botanic medicine for thousands of years. Sorrel is related to the rhubarb plant, which explains it’s tanginess. And it is zesty enough to stand in for lemon in a variety of recipes. 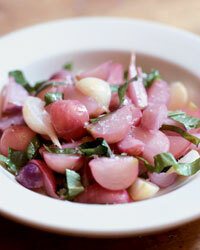 Try shredded sorrel raw in salads — it can even replace the dressing. “Sorrel imparts so great a quickness to the salad,” said 18th-century herbalist John Evelyn, “that it should never be left out.” Raw leaves are nice in sandwiches, used as a garnish, or layered between fillets of fish or chicken before baking. When cooked, sorrel has a variety of uses, from classic soup to sauces for fish and poultry. Combine garlic, nuts, and cheese in food processor and pulse until the mixture has a coarse texture. Add in sorrel leaves and pulse until combined. Stream in olive oil until desired consistency is reached. Season with salt and pepper and serve over warm pasta, couscous, or as a dip. 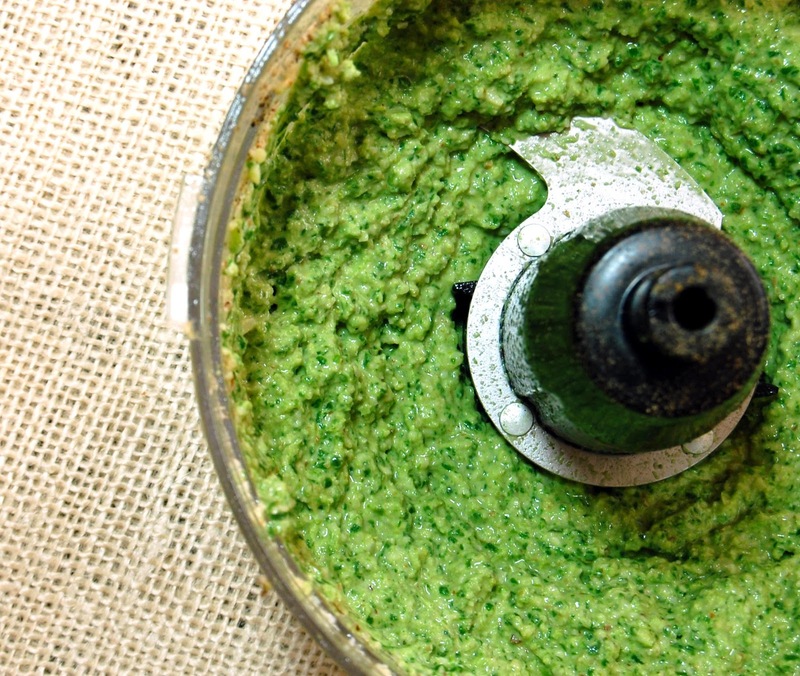 To use the pesto on pasta: For every pound of dried pasta cooking in a kettle of boiling water, stir together in a heated serving bowl 3/4 cup of the pesto and 2/3 cup of the hot cooking water. When the pasta is al dente, drain it in a colander, add it to the pesto mixture, and toss the mixture until the pasta is coated well. Preheat oven to 450 degrees. Combine yeast and water, and let stand until foamy, about 5 minutes. Stir well. Pulse flour and 1 teaspoon salt in a food processor to combine. Add yeast mixture and oil. Process just until dough forms. Turn dough onto a lightly floured surface. Knead for 1 minute. Shape into a ball. Place in an oiled bowl, and turn to coat. Cover loosely with plastic wrap. Let rise until doubled, about 1 hour. Punch dough. Divide into 4 pieces. Shape each piece into a 6-inch disk. Drizzle with oil. Sprinkle with salt. Place flatbreads on an inverted baking sheet. Bake, without turning, until both sides of each flatbread are golden, 10 to 12 minutes. Let cool completely on sheets. Cut each flatbread in half crosswise. Spread 2 tablespoons pesto on each flatbread, and top with 1/2 cup edible weeds. Drizzle with oil, and sprinkle with salt. Serve immediately. Whisk together all dressing ingredients in a large bowl. Toss together all salad ingredients with dressing in bowl. Season with salt and pepper. Preheat oven to 375 degrees. Spread goat cheese (or any strong flavored cheese) in the bottom of a pie crust. Cover with chopped sorrel and scallions. Beat eggs, salt and milk together. Pour over greens. Sprinkle with parmesan cheese. Bake for 35 to 40 minutes or until top is golden brown. 1. Put butter in large skillet, preferably nonstick, and turn heat to medium-high. When butter begins to melt, swirl it around pan. When its foam subsides and it begins to brown, add the chicken, skin side down. Cook, rotating pieces after 3 or 4 minutes so they brown evenly. As they brown on the skin side, sprinkle them with salt and pepper and turn them over; sprinkle skin side with salt and pepper as well. If necessary, lower heat to medium to prevent burning. Remove chicken to a plate when chicken is completely browned all over, in 10 to 15 minutes. 2. Immediately add onions to pan and cook, stirring occasionally, until they begin to soften but still hold their shape, about 5 minutes. Add 1/2 cup water and cook for a minute, stirring occasionally, until it reduces slightly. Return chicken to pan, turn heat to medium-low and cook, covered, for about 10 minutes. Uncover, add sorrel, stir, and cover again. 3. Cook about 10 minutes longer, stirring occasionally, until chicken is cooked through and sorrel is dissolved into onions and liquid. Serve hot, with rice or crusty bread. Preheat oven to 425°F. Wrap beets in foil in 2 packages (3 per package) and roast in middle of oven until tender, 1 1/4 to 1 1/2 hours. When cool enough to handle, peel beets and cut off stems and root ends. Halve beets crosswise and arrange, cut sides down, on a work surface. Cut out a cylinder from each half with cookie cutter. Halve each cylinder lengthwise, then cut crosswise into generous 1/4-inch-thick slices. Line a tray with plastic wrap and brush plastic wrap with some oil. Cut cheese logs crosswise into 1/4-inch-thick slices with an oiled knife, then halve slices. Arrange cheese slices in 1 layer on tray and brush with some oil, then top each with a slice of beet. Arrange sorrel leaf halves, veined sides up, on work surface. Put a cheese and beet stack in middle of each leaf half, then wrap sorrel over stack and secure with a pick. Cooks notes:·Beets can be roasted and sliced 2 days ahead and chilled in a sealed plastic bag. ·Cheese and beet stacks (without sorrel) can be assembled 1 day ahead and chilled on tray, covered with plastic wrap. ·Sorrel leaves can be trimmed 1 day ahead and chilled in a sealed plastic bag lined with dampened paper towels. 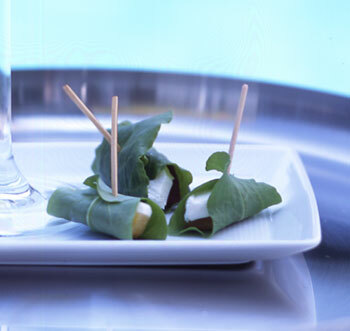 ·Hors d’oeuvres can be assembled 4 hours ahead and chilled, loosely covered with plastic wrap. In a large skillet, bring the vegetable stock and butter to a boil over moderate heat. Add the radishes and cook, stirring occasionally, until they are crisp-tender and the liquid has thickened slightly, about 15 minutes. Season with salt and pepper and transfer to a shallow bowl. Scatter the sorrel over the top and serve.